Four Tines and a Napkin: Brunch | Clinton Street Baking Co.
Last weekend, my co-worker Jess and I decided to do a Saturday brunch at Clinton Street Baking Co. I distinctly remember reading about it a couple years ago in a DailyCandy "Weekend Guide" e-newsletter I had received, which waxed poetic about the bakery's "buttery, fluffy flapjacks." Even after reading a bunch of reviews on Yelp and assorted food blogs, I failed to realize that I should have heeded the advice from these reviews. Jess and I arrived around 10 AM, only to find that it would be an anticipated (a pretty rough estimate) wait time of an hour to an hour and a half. I told Jess we could just wait it out, and if we got really hungry, we could always leave and go somewhere else. Jess agreed that would be best, and luckily, we were able to find two free plastic patio chairs so we could sit while we waited and caught up on the latest happenings in our lives. We nearly gave up on waiting until the maître d' came out with a fresh plate of pancake samples. After that first bite, Jess and I knew we'd be staying for the long haul to order our own personal plate of the fluffiest flapjacks we've ever had. After waiting a little over two hours (that's dedication, I know! ), Jess and I waited inside before we were promptly seated in one of the tables. 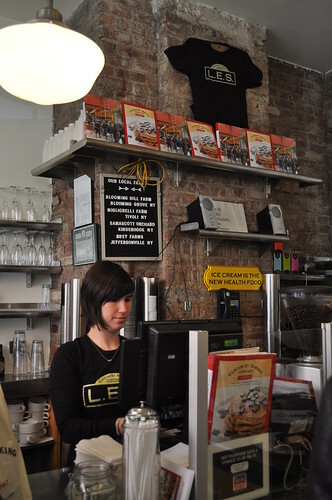 Inside Clinton Street Baking Co. 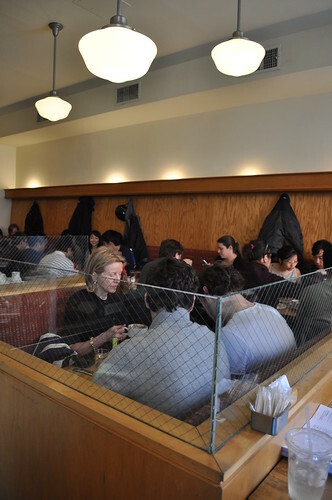 It definitely has that old mom-and-pop diner feel to it, which I always like about going to brunch. It loses the pretension of brunch in the city, stripping it down just to simply delicious food--something I prefer most of the time when I'm finding somewhere to chow down on solid breakfast offerings. 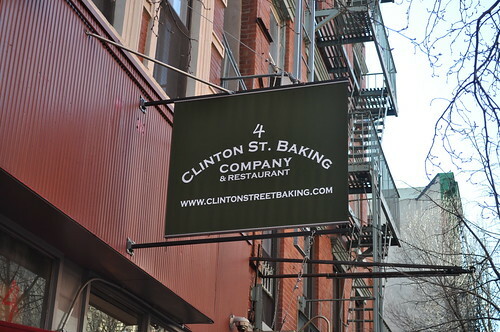 The cafe/bakery part of Clinton Street Baking Co. Please note the really cute sign in yellow that reads "Ice cream is the new health food." The morning cocktail bar--all the tools you'll need for a delicious Bloody Mary and other assorted cocktails offered on the menu! 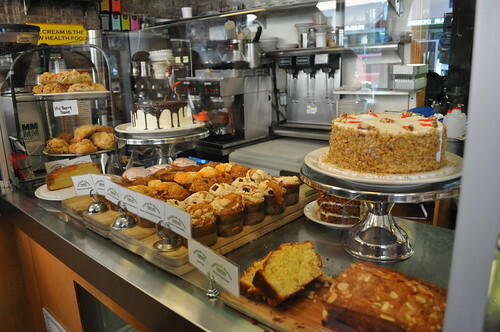 The baked goods counter at Clinton Street Baking Co. 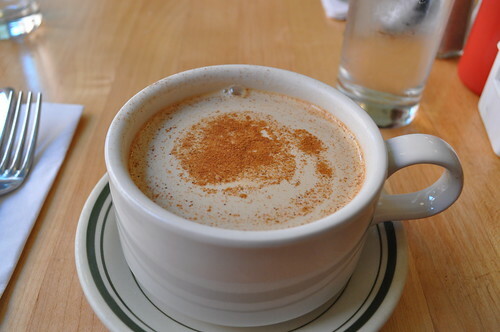 I started brunch with fresh apple cider that is mulled and served hot. There's nothing better than a cup of warm, mulled cider to welcome the day ahead. I wanted to order a side of bacon with pancakes (see more below), but I was torn between the double smoked bacon and the sugar cured bacon. So I asked our server for her recommendation, and without hesitation, she said to go with the sugar cured bacon. Her confidence in her answer told me I was making the right decision. A great decision, all right! The sugar cured bacon was coated in sugar, which caramelized before being served, adding this amazing sweetness to the otherwise already salted and savory bacon strips. It reminded me very much of the flavors from the sauce on honey barbecue wings. Another plus was that the bacon wasn't measly or too skinny or thin. It was thick, just as all bacon should be, with the perfect amount of fat! 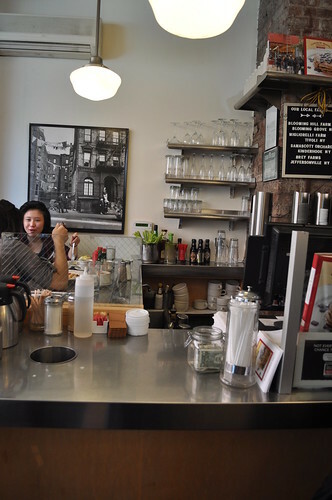 So the sugar cured bacon is a must-have complement to brunch at Clinton Street Baking Co. 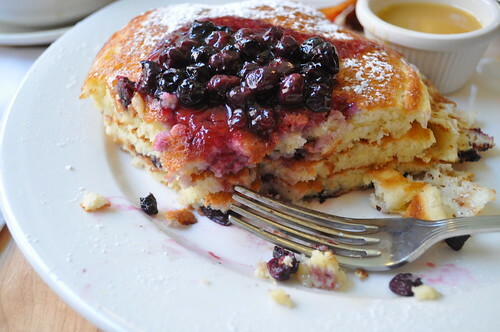 So here are the amazing pancakes that are made and served at Clinton Street Baking Co. 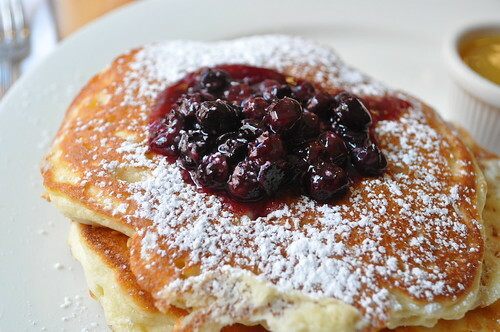 They are classic pancakes served with warm maple butter, in three different variations: wild Maine blueberry, banana walnut, or chocolate chunk. Jess and I both went with the wild Maine blueberry topping, as we were observing other brunch goers and seeing which pancake seemed to be the most popular. Low and behold, it was the blueberry ones! Covered in confectioners sugar, these pancakes were simply divine. They were everything the ideal stack of pancakes should be--the exterior texture was reminiscent of the crispiness found in a freshly made Parisian crêpe and the interior was intensively fluffy. The warm maple butter made for the best alternative to syrup, combining the flavors of warm butter and maple from the usual maple syrup. And oh, the aroma--I'll always remember it whenever I think about pancakes, especially these pancakes! Just like the joy you get when you step foot into a kitchen, post-baking of fresh chocolate chip cookies, the smell of these pancakes will effect such an emotion with you, too. I guarantee it! They even had blueberries in between each pancake in the stack! Findings: Despite the long two-hour wait for a table, Jess and I enjoyed these pancakes so very much! I'll even go as far to say these are the best pancakes I've ever had (and I'm sure Jess will even agree with me)! Totally worth the wait! My strong recommendation is to get here early--no matter what day of the week. I've read that even on weekday mornings, this place is just as happening! And even if you decide to order something else besides the delightful pancakes (even though you really, really should! 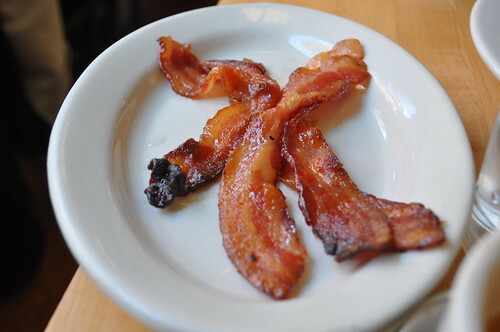 ), a side of sugar cured bacon is nonnegotiable. You NEED to order these. I would love to go back during an "off" hour (whenever that may be, haha) and try its dinner offerings. But until then, a major round of applause for these crispy, warm, buttery, fluffy pancakes. Also, just a BIG thank you to Jess for taking me out to brunch as a belated birthday celebration :) Lots of hugs to you! Glad I was able to try these amazing pancakes with you! Price point: $13 for a stack of three pancakes, $3 for a cup of hot cider, $4 for a side of bacon.